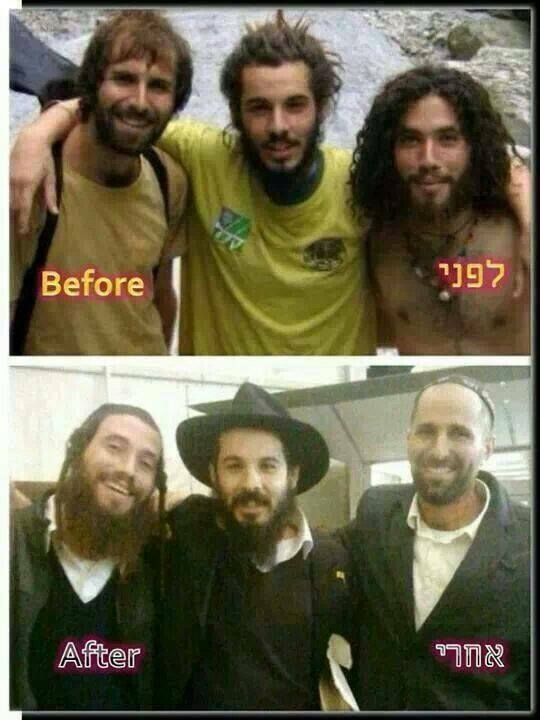 3 Friends Become Hasidic – The Before & After Picture is Epic! Many secular Israelis pack their bags after the army and go soul searching in India. Sometimes one of them is inspired to adopt the orthodox Jewish lifestyle in the process. This time all three friends decided to become hasidic – all in different hasidic sects. This before and after picture will leave you wondering what you may look like as a hasid and what hasidic folks would look like if they were just dudes and gals. Search for the “Jewbellish Meter” APP to see what you’d look like as a hasid. – One is not permitted to throw out an image of the holy LoopHoler Rebbe. One must cut out His image and bury it before throwing out the WSJ. – The LoopHoler Rebbe, however, allows you to draw a new nose [in black ink] on His image, in order to throw it out. That visual nasal adjustment renders the image to the category of “some other Jew” and not the holy LoopHoler. Thereby being permissible to trash. – If one is “too lazy” to recycle the WSJ, the LoopHoler allows you to accidently spill coffee on the paper and then trash it. The spill places the recyclable paper into the trash category. Check out what’s hot right now on Jewbellish. All he was doing was walking while Jewish. But what happens next is no surprise to any New Yorker. I was giving a talk before 400 people at a reform temple in New York. I started the talk asking the audience to raise their hand if they’ve ever been approached by a hasid asking if they were Jewish. Last week we posted one such REAL episode of a Chabad Hasid running after a New Yorker to blow shofar. In that spirit, Scott Rogowsky created this video parodying the YouTube hit: 10 Hours of Walking in NYC as a Woman. It turns out the Nazis’ “perfect Aryan” baby isn’t actually, well, Aryan. Hessy Taft, the winner of a 1935 contest commissioned by the Nazis in Germany to find the most beautiful Aryan baby, recently revealed that she is Jewish. “It’s supposed to represent the perfect Aryan baby, but it was me, a Jewish child, on the cover … of a Nazi magazine,” Taft explains in a video interview posted online Tuesday by the USC Shoah Foundation (watch below). It’s believed that Nazi propaganda minister Joseph Goebbels chose the image himself. “I can laugh about it now,” Taft said. “But if the Nazis had known who I really was, I wouldn’t be alive.” The image also appeared on postcards used throughout the Third Reich. While Taft’s father was arrested by the Gestapo in 1938, he was soon released, and the Nazis never learned of the baby’s true identity. The family soon fled Germany and ultimately ended up in the United States. Taft recently presented Israel’s Yad Vashem Holocaust Memorial with the magazine bearing her photo. “I feel a little revenge — something like satisfaction,” she said when making the presentation.